There is only one thing that interacts with the principal mass-spring system of a loudspeaker: the environment that surrounds the radiating diaphragm. In this section the properties of this environment will be investigated and the notion of acoustic suspension type will be introduced and discussed. The radiating diaphragm of a loudspeaker has two faces or sides: The front and the rear-side. We know that in most cases loudspeaker diaphragms radiate in open space from their front-side while their rear-side is confined by the speaker's enclosure. Woofers placed into subwoofer cabinets are obviously a different case. Theoretical Acoustics state that front-side radiation in open space introduces two 'mechanical loads': a small air-mass (Mmr) and a small damping resistance (Rmr). Both of them are not constant; they are frequency dependent. Air-mass values vary from 0.23gr for a 4.5'' woofer-midrange to 3.66gr for a 10'' woofer. This quantity adds to the driver's diaphragm mass Mms giving what we call total moving mass (Mmt). In many datasheets both values are mentioned. Manufacturers measure the various parameters at very low frequencies with their woofer drivers unmounted in free air. In such conditions, air-mass value is not the same with the case of a woofer mounted on an typical speaker baffle. Thus a free-air driver's resonance frequency (fs in Hz) is a bit different if this driver is mounted on a typical speaker cabinet. In a similar way radiation resistance Rmr adds to the inherent loudspeaker's damping. However it is negligible at very low frequencies where manufacturers get measurement values for their datasheets, hence we deduce that we need not worry about it. Rear-side waves are transmitted inside the enclosure whatever this may be. Enclosure reacts to diaphragm oscillatory motion introducing its own mechanical loads. Its properties determine the nature of these loads and how they attach to the loudspeaker's mass-spring system and change its resonant frequency and finally its SPL response. 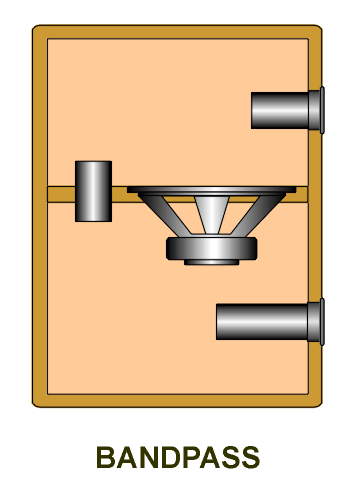 In a Closed Box design the rear side of the diaphragm assembly of the woofer driver radiates inside the cabinet confined space. Sound wave energy is converted to heat dissipated over the surface of the interior cabinet walls and at the absorbing material usually placed inside. In a Vented Box or Bass Reflex design rear-side waves are transmitted through cabinet air and then pass through the vent tube. In this way they are retransmitted to open space adding to driver's SPL response. The case of a Passive Radiator design uses a special sort of driver that incorporates only a diaphragm assembly without a voice coil ie. without any electrical excitation in general. Sound waves emitted by the rear side of the normal woofer driver towards the inner space of the cabinet reach the diaphragm of the passive driver and set it to motion. In this way its front side creates and emits additional sound waves that reinforce the SPL response of the normal woofer. These speakers have a complicated inner cabinet construction. Rear-side radiation of their woofer travels through a long tunnel which operates as an acoustical transmission line the end of which releases them to open space. Their mathematical analysis is far more difficult than of the VB design. Dipole speakers have open cabinets. A front baffle along with a left and a right side walls make sure that both front and rear-side sound waves propagate in the listening environment using all of its reflecting surfaces on behalf of the overall SPL response and soundstage reproduction. Bandpass speaker systems are low frequency sound sources. Their woofer driver has no open space wave emission. Driver is hidden inside the speaker's cabinet. Enclosure volume is divided into two separate chambers where front and rear-side radiation propagate. At least one vent radiates towards open space. Various types of BP systems exist with only one or two or three vents as illustrated. For the time being we have decided to provide detailed analysis of only the CB and VB acoustic suspension types in the next sections of this tutorial series.